Mediocrity is starting to creep into the world of education and specifically into the practice of teaching. I am afraid that it might always have been there and I am just now becoming increasingly aware of it. While many might want to place the full blame on teachers, I think there might be plenty of blame to go around. There are a handful of people that are responsible for the prevalence of mediocrity in the profession of teaching. This is obvious in the fact that they are fixated on stories that paint teachers in a negative light rather than focusing on the great things happening on a daily basis. In a recent session at a local technology conference there were reporters from NBC, ABC, CBS, and Fox and they all admitted they don’t even have education reporters on staff. What does that say about their priorities? This is sad because they have some real power to sway public opinion about teachers and the current trends in education. Most administrators encourage mediocre teaching more through their inaction rather than their actions. Lots of people feel as though teacher tenure is a problem and keeps poor teachers around. However, a tenured teacher can be let go if the administrator goes through the legwork to do so. Unfortunately, many do not put in the work to do this and the cycle of poor teaching is just reinforced. In most cases, teachers keep their heads down until their reach tenure because one they get it; they know administrators won’t do anything to remove them. In some cases, the administrators have not been properly trained on what “good teaching” looks like and therefore are not good judges of it. Sadly some administrators were not good teachers themselves and therefore don’t even know what a good teacher looks like. (I think they wear a tieJ) Another area is the lack of administrator presence in most schools beyond the front office. Are administrators in classrooms observing, teaching or interacting with kids on a regular basis? If not, they cannot hope to have an understanding of the quality of teaching or learning happening in their schools. In many states teacher unions have been slammed and in some cases dismembered. Now, I value the intent of a union to protect the rights of its members as well as its role in collective bargaining. There are many things teacher unions do in favor of teachers. With all that being said though, they are guilty of protecting mediocre teachers in many ways. Again, I am not suggesting we need to toss out teachers due to low standardized test scores as some have suggested. However, there are things being done in schools by teachers that should be immediate grounds for removal and not be blocked by a union. In many other blue collar unions, they uphold the highest standard of their profession and certainly don’t protect those that fail to live up to that standard. In addition, unions often create combative and adversarial situations between its members and policy makers and administrations. This leads to change being near impossible and again continues the cycle of the status quo on many fronts. As a parent and a teacher, I have a unique perspective of being on both sides of the education fence. Most parents, though, are not aware of the education their kids are receiving beyond the infrequent notes or emails that come home. They assume since school worked for them, it should be the same and often do not question much of what happens. There are too many examples of things going on in schools without parent’s knowledge. Parents need to take a more active role and schools need to be more transparent and welcome parents into the schools. Also, parents should not have to “settle” for mediocre teaching for their kids. Students are obviously the ones that hurt from the prevalence of mediocrity in our profession. On a daily basis they go through classes taught by a spectrum of teachers. In many cases, they have fabulous teachers that care for them and are outstanding in what they do. Yet, they still have a handful of teachers that in most people’s opinion should not be teaching. Their response is often just to complain amongst themselves and just deal with it. This is also reinforced at home when a parent simply says, “that’s school…just deal with it and hope for a better teacher next year.” I am not saying kids need to rebel against their teachers, but they certainly need to exercise their voice and demand the best. In most cases, kids know what good teaching is and what is not. From policy that ignores what is best for kids, to policy makers with no education experience, the world of educational policy is doomed to continued mediocrity. In the face of common sense and sound research, our educational policies do nothing to lift up the profession of teaching. Instead, it ranks and files teachers and students with little regard to what life is truly like in a classroom and what their policies mean for kids or teachers. The few attempts to lift up our profession are often superficial with no real intent to change but are more often a political agenda in an election year. Teachers are probably the biggest problem within our own profession. We don’t want to confront our fellow teachers when we see opportunities for growth within them. Instead, we just shut our doors and do good by our own kids. Heaven forbid if we made a suggestion or offered criticism without fear of personally offending someone. We don’t share our good lessons because we are afraid somebody else will get credit for our hard work. In some cases we are being ranked against our colleagues and we would not want anyone having an advantage. When our own teachers are lifted up and recognized we shun them out of jealousy and envy. If we have a mediocre administrator we do nothing but complain in our lounges or behind closed doors because we fear repercussions for speaking out. Many of our teachers instruct in the exact same manner they were taught when they were in school 10, 15, or 25 years ago. If we are non-tenured we take what is given to us and do exactly what we are told for fear of losing our job. We want our students to be lifelong learners and yet we fail to model this on a daily basis. In reality, many of us are just as afraid of failure as our own students. This is not totally our faults as our administrations, policy makers and in some cases the media have made it clear that failure is not an option for teachers in any way. Thank you for your honest and forthright portrayal. As a teacher and then and administrator, I have experienced much of what you describe. Although I have worked with many professionals who are reflective and who strive to examine and improve their practice to ensure their students both learn and are engaged in their learning so that they can be lifelong learners, I have also seen many who are not as you describe. Those educators are mediocre at best and often have personal issues or baggage that get in the way of doing what is right and what is best. Although these teachers often do not do great harm to students from home environments where opportunities for learning are provided outside of school, I believe great harm is done to students who would become confident and competent learners if they work with effective teachers who care about their practice and who believe they are responsible for their students. As an administrator, I did everything I could to create an environment of high expectations with high support for all teachers. Several teachers thrived in that environment - to the benefit of our students. Unfortunately, there were others who worked tirelessly to focus on the students who "did not" - did not do homework, follow rules, comply with teachers' demands (however unreasonable), or have the 'right' parents. And some of those teachers held influential positions in the teacher's union. The end result - mediocrity and status quo "win;" kids and committed educators lose - big time. I wish you the best in your continued efforts - your students are fortunate! Great post, Josh! I agree with both you and Anonymous, I too have been frustrated by people who think mediocrity if okay. In fact, I was inspired years ago by a poem Charles Osgood wrote called 'Pretty Good' that reminds me of your post. Thank you for this post and thank you for fighting the fight for teachers and parents but especially for students. Best and most honest thing I've read in a long time. 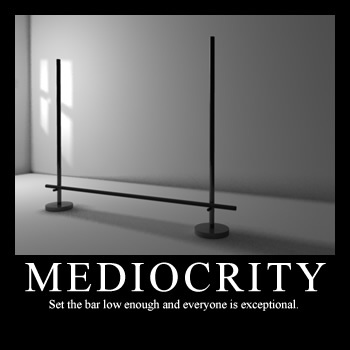 You are absolutely right that we tolerate mediocrity in education, and for some educators (teachers and admins), mediocre is how they are on their best day. For too long, unions and administration have played a game of chicken, where both sides chicken out and less-than-adequate teachers are allowed to keep doing what they've always been doing. It will be very interesting to see what happens here in WI after Governor Walker eliminated much of what teacher unions can bargain for in their contracts. Gone are the days of Last Hired/First Fired when it comes to layoffs. Evaluations finally mean something. As a principal myself, I can no longer use the union excuse (and regrettably I have used this excuse) for not having higher expectations for my staff and for myself. The power for improvement lies within our schools and within our teams. We don't need the billionaire boys club to fund school reform in the US. It could and should come from those already in the schools. We all (teachers, admins, Boards, parents, community) need to be more professional and have higher expectations for each other. That will make the difference we need. "In many other blue collar unions, they uphold the highest standard of their profession and certainly don’t protect those that fail to live up to that standard." In (many of?) those blue-collar unions, you can't become a member just because you have a state license and got a job in a union shop. You have to apprentice, and the union controls whether you advance beyond that rank or even stay in the union. The union provides meaningful training and the job site provides job-specific training. In professional organizations (the AMA, for example), members can join simply by paying a fee and have learning opportunities available, but don't get any sort of job security or other protections (beyond lobbying). In education, all you need to join is a job in a union shop, and most of our training is expected to be done individually or through the employer. Thank you so much for your honesty! Ive been from LA to Chicago, to San Diego and now to Detroit - and what you say is true everywhere! Double kuddos for pointing out the gap between parents and their child's education - I too, play both roles - and see how parents are often downright dismissed in our profession. Thank you for your blog from another in the trenches who is trying elevate the mediocrity along with you! 1. Teachers are often mediocre when they start. I know that I struggled in the beginning. We have to allow for some nuance and some understanding of the context. 2. Unions don't exist to protect the interests of kids. They are there to protect the rights of workers. While it is sad that they protect bad teachers, they also protect many great teachers who are losing their rights due to political pressures and personal attacks. 3. A great deal of the mediocrity is a result of the demonizing of the teaching profession. Groups with benign-sounding names are stripping away the rights of teachers, adding a kill-and-drill approach and pushing for more test prep. Quality teachers are leaving as a result. 4. 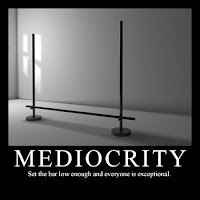 I've noticed that places that focus on combating mediocrity, especially with accountability, end up doing the opposite. They create an environment of fear and low morale, with even the best teachers being forced to defend themselves and to worry about how they are perceived. When there is a greater vision of quality education, along with a trust-based environment and meaningful professional development, the results are a culture that doesn't fall into mediocrity. Teacher unions are not in the business of protecting mediocre teachers, they are in the business of protecting all teachers rights, Even teachers who are not paying members. I ask you who is at your state capital lobbying for teachers' pension, evaluation processes and funding for education. In the state of Kansas it is the teacher union, KNEA. I am a proud member and I ask all teachers to support the one association that protects all of our rights. I started teaching in the mid-1970s. Everybody was talking, back then, about how mediocre education was--not rigorous enough, the incoherent cafeteria-style curriculum, flat and predictable instruction, the number of not-very-smart, lazy teachers (with the requisite "sure, some are good" disclaimer). And then--inevitably--someone would blame all that mediocrity on the unions. The people who did the blaming saw themselves as the "good" teachers, by the way. It's always someone else who's mediocre--or failing. And it's almost always the newer, younger (more vulnerable to layoff) teachers pointing the fingers at "mediocre" veterans. In fact, Michelle Rhee has tapped into that belief that younger teachers are often more valuable than experienced veterans (not to mention more malleable and much cheaper). John Spencer nails it, in his comments. Thanks for the comment and taking time to read. I am not advocating for getting rid of all teachers and making assumptions about new or old teachers. There is always room for improvement and that is what I am going for...too often we get complacent and are mediocre in our approach to our jobs. You mention Michelle Rhee, and I wonder about her merit and intentions. Have you seen her work around standardized testing and the cheating scandals in DC? I think your point about younger teachers being valuable is good but to say they are "more" valuable than veterans is an assumption. All teachers have value and have an obligation to be better for the sake of their students. Many first year teachers are painted into boxes of teaching conformity they never get out of. The systems within our schools often prohibit change and that is what I am trying to change. We can all be better, myself included. I like every post in this blog. Really a nice work has done I appreciate the blog owner. There are a handful of people that are responsible for the prevalence of mediocrity in the profession of teaching. Thank you for writing this post - I am a career changer who brings the perspective of business into the classroom. My experience in education has been a mixed bag - I LOVE the kids and the art of teaching; however, I strongly despise the logistics and politics of the "industry". It has been my experience that peers rarely appreciate excellence in the classroom. As a passionate teacher who avoids the faculty room but encourages collaboration on the student's behalf and will do whatever it takes to educate a child, I am often met with resentment and caddy chatter. By simply asking questions of those who are more senior than I, sharing ideas with peers, or going above and beyond for the sake of the students, I often find myself in awkward and adversarial situations with those who claim to be "professionals". Thank you for putting into words what I have yet to do - Your honest critique of education is greatly appreciated. It is refreshing and exciting to know that someone else out there shares in my opinions & grievances with the profession. I think we could all those in education would benefit from the words of a motivational speaker, Jim Rohn: "Don't wish it were easier. Wish you were better". Please, read the research report called "The Irreplaceables". Now you will have data to support what needs to be done in education.